The case of SafeWork NSW v Harris Holdings NSW P/L; SafeWork NSW v Harry Zizikas  NSWDC 299 is interesting for a number of reasons. 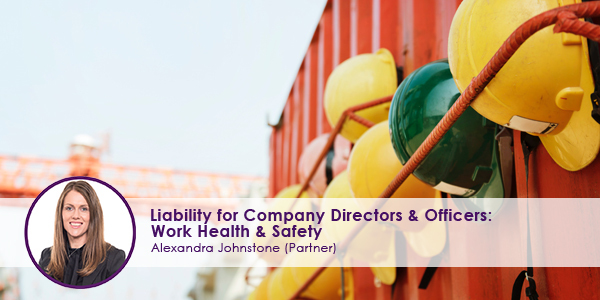 This case in highlights the important responsibilities of directors and officers in terms of ensuring the work, health and safety of employees. The case also highlights the importance of putting even simple, straightforward and reasonably practical safety measures in place in the workplace. The relevant workplace in this case was that of Harris Holdings, being a business processing domestic and commercial weight including disposal and recycling of waste product and demolition and building site waste. At the workplace, Mr Mohammad was responsible for sorting and processing commercial and domestic waste. Tragically, Mr Mohammad was hit by and caught his foot in the excavator tracks when that excavator moved. Mr Mohammad was wearing his high visibility clothing at the time of the incident. Mr Mohammad was not responsible for operating the excavator but worked nearby the excavator. The operator of the excavator was initially unaware of the actual incident because he was facing forward and could not hear the commotion surrounding the incident. Mr Mohammad was dragged about a metre forward. After Mr Mohammad was freed from the tracks he unfortunately suffered cardiac arrest and tragically and avoidably died on the site. There was no documented system of work in place for the tasks undertaken at the site. Manuals had not been provided to the site workers on the actual site. The manuals provided to SafeWork NSW did not specifically address the excavator. (Generally speaking, the content of the manuals was generic in many respects). No formal work health and safety procedures were developed for the site or implemented. The four (key) site workers were unaware or unclear as to what a risk assessment, safe work method statement and tool box talk were. There was no documented risk assessment for the excavator. The relevant Australian Standard regarding Powered Industrial Trucks had not been implemented, including failure to create a safe zone around the excavator. The actual manual for the particular excavator had not been followed. The procedures on the warning sticker within the cabin of the excavator will also not followed. There was no traffic management plan in place. Harris Holdings was convicted. SafeWork NSW ordered the company, Harris Holdings to pay a $300,000 fine, 50% of which was paid to the prosecutor. Prosecutor’s costs were also required to be paid. The sole director was convicted. ensuring that health and safety are presented either received their entitlements to training. e) To ensure that the person conducting a business undertaking has, and implements, processes for complying with any duty or obligation of the person conducting a business or undertaking under the Act. The sole director (Harry Zizikas), had failed his duty under this section 27 of the Act to ensure that Harris Holdings hard complied with its primary duty of care under section 19 (1) which can be summarised as ensuring, so far as is reasonably practicable, the health and safety of workers. Mr Zizikas was required to pay personal fine of $60,000, 50% of which was paid to the prosecutor. Again, prosecutor’s costs were also required to be paid. Clearly, both companies and their directors and officers should not underestimate the importance of putting even simple, straightforward and practical measures in place to address, work health and safety risks. Practical measures can be implemented to (at least partially) address, work health and safety risk. For example, practical measures such as following the warning sticker, reading and understanding and implementing measures from the manual, purchasing the Australian Standard and implementing it. Training and education of staff is very important. Considering and addressing risk upfront, as well as having the right systems and processes in place is paramount to ensure the work health and safety of your employees. At Coutts we provide legal advice in respect of compliance with your obligations under the legislation. Further, we are here to workshop risk allocation for each of your projects and to ensure that that risk allocation importantly filters through to your contracts in a clear and practical way. We ensure that your important work, health and safety processes and procedures are adequately dealt with in your contracts and subcontracts. Newer PostAre you aware of your rights when purchasing a new car? Older PostWe're Friends ... Do I Really Need A Property Settlement With My Ex?